Hello ad Happy Monday! I hope you all had a great weekend!! Today is my Design Team day over at My Craft Spot and the challenge this week is: For your Sweetheart! 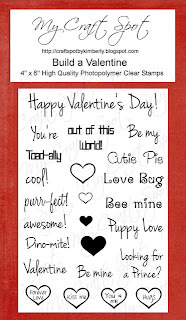 I have used My Craft Spot's Always & Forever and the Build a Valentine stamp sets for my card. 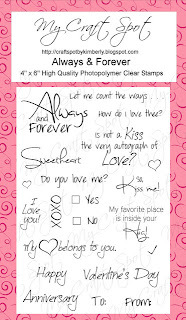 These are such fun stamp sets to have to create cards or layouts for Valentine's Day, Weddings, Anniversary's. 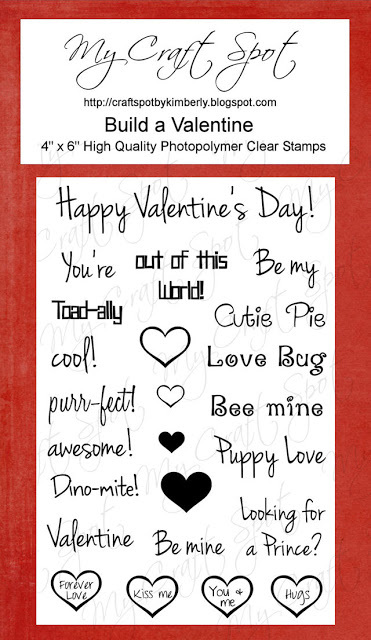 Go HERE to check out all My Craft Spot's fabulous stamp sets! We hope you come join us in this fun challenge...we would love to see what you create! Isn't this monkey just the cutest?? I cut the monkey at 4" from the Create A Critter 2 cartridge and all the layers. I stamped that adorable face with Peachy Keen Cute & Cuddly stamp set and then added a cute bow using Blueberry Trendy Twine from My Craft Spot. The branch is cut at 4 1/4, the hearts are cut at 3/4 and 1 1/4 all from this cartridge. The adorable sentiments are from the Always & Forever set. I have glittered around the hearts with angel dust, added a 3 GIRL JAM ice blue crinkle ribbon bow along with a My Craft Spot's Bittersweet jute bow and button from Heidi Grace. The fun skittles (cupid copper) are from my friend, Carri at Double Click Connections. Thanks for stopping! Be sure to pop over to My Craft Spot to see what my Design Team sisters have created for you and then come back and join us!!! This is so super duper adorable!!! I LOVE that cute monkey and the GREAT card design!! Too cute. Love the little monkey. Great design. AWESOME card...I love all the details! super duper cute sherrie! thanks for playing with us at My Creative Time's Designer Challenge! This is so super cute..love the little monkey dangling!! This is just so cute. I love the skittles and the distress paper. Have a great crafty week. What a fun card Sherrie! Love the layout and the torn paper - so cute! And, that little monkey is just too cute with his sweet little face. Great accents- love the glitter, twine and bling! Hope you have a wonderful Monday! Sooo fun! Love how you added the twine! So cute!!! Love the pretty vine he's hanging on and his darling face, also love the little twine bow!!! 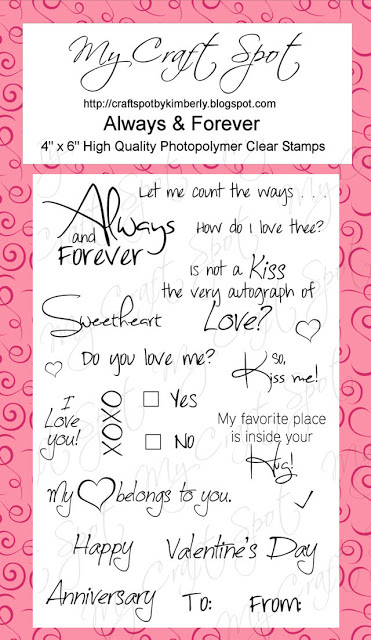 Such a cute card for your sweetie! Love the sentiments you used. So adorable! Oh my gosh, that is the cutest monkey!! Look at that sweet face!! The heart vine is adorable!! I love the glittered hearts and the design!! The colors are fabulous!! Love everything about this my friend...it is gorgeous!! I hope you are having a wonderful day and aren't buried under a ton of snow!! Love,love,love this card my friend!I adore the little monkey and the vintage feel and colours. Adorable card Sherrie! That little monkey is too cute. Happy Monday! Sooooooooo cute!! I love love love the hearts and the monkey!!! Too too cute.love the torn paper and face. Your card is just so sweet!! Love it!! Thanks for joining us in this week's Peachy Keen Stamp Challenge! Too, too cute Sherrie! I love the monkey, torn paper and the stitching!@! This is adorable! What a darling stamp set too! Congrats on 2 years. I have always loved looking at your work. That monkey is so adorable Sherrie!! I love the glitter you added to the hearts. oh how cute is that monkey, great colors! I love that sentiment and the glitter. Super cute as always Sherrie! What a clever card, Sherrie! It means a lot to me that you joined in the challenge at SPS. Thank you!!! So cute and fun! I love the torn paper. This is so sweet, Sherrie! I love the look of the blue and red combination - and the torn paper is fabulous! It works so well with this card. How clever to add heart leaves to the vine too! And that monkey - just too adorable, especially with her little twine bow! !